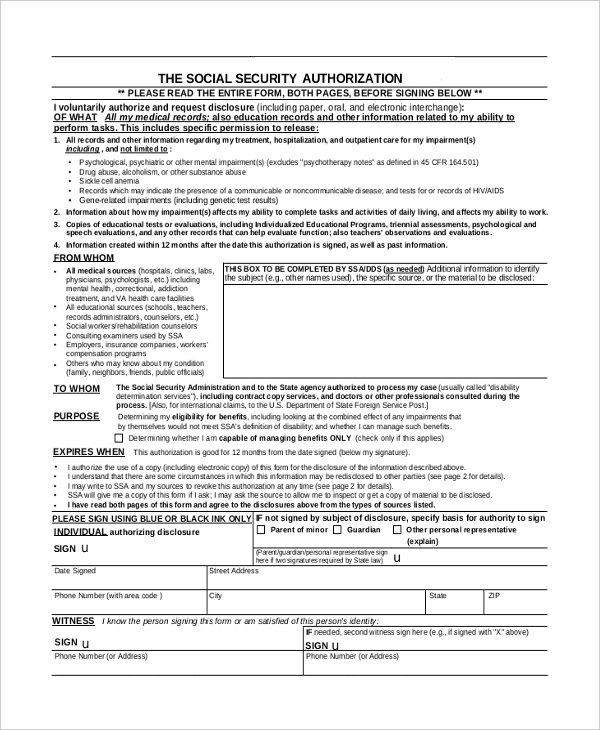 Authorization forms help one to authorize an agency, third party or insurance companies to provide service or activity with ease. They are legally valid documents and enable to perform payment transactions legally. They help in providing business continuity and enable service organizations to perform without any mess. They are utilized in various situations and one can search Google using authorization form sample, authorization form to release information or prior authorization form for blue cross blue shield to know more information about them. 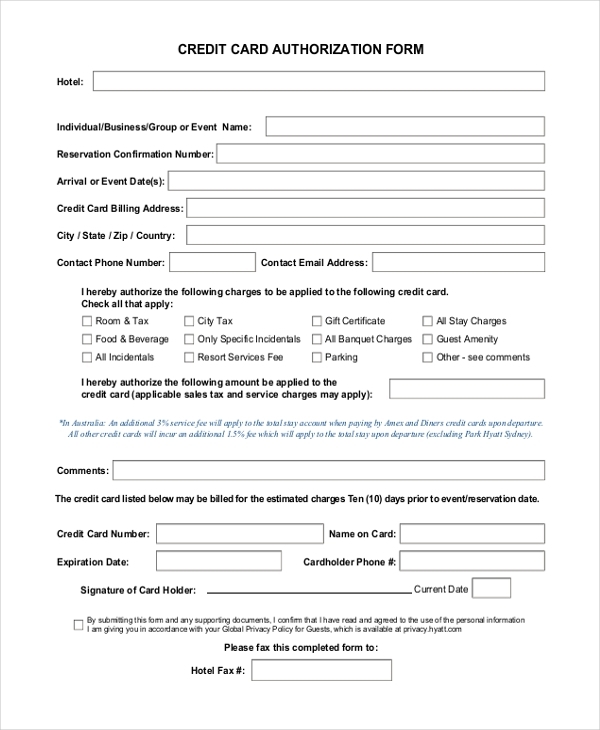 This credit card authorization form presents hotel name, event or business name, reservation confirmation number, arrival or event date, credit card billing address, contact information, various charges applicable and credit card details like card number, name, expiry date, cardholder contact number. 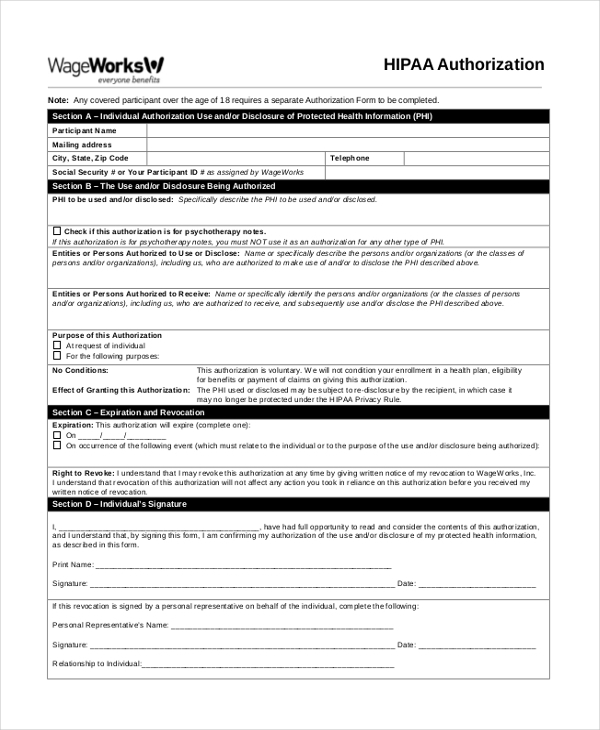 This HIPAA authorization form presents participant name, mailing address including city, state, zip code and contact information. The HIPAA details like the purpose of the authorization are also presented. The expiry and revoke details, the signature of the representative, name are also mentioned. 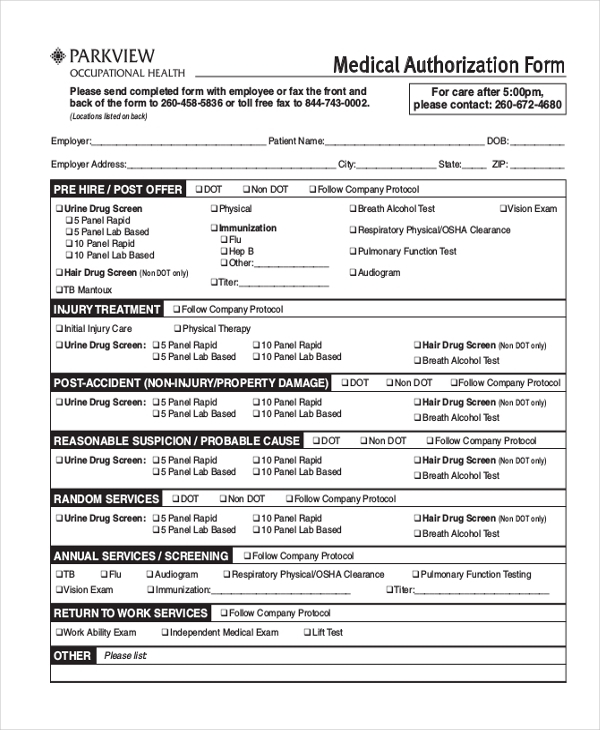 This medical authorization form presents various medical screening tests and immunization details for a variety of services like injury treatment, post-accident, random services, annual services, return to work services. Some of the screening tests include flu, tuberculosis, visual examination, lift test, workability examination, etc. This form enables to access one’s personal health information. 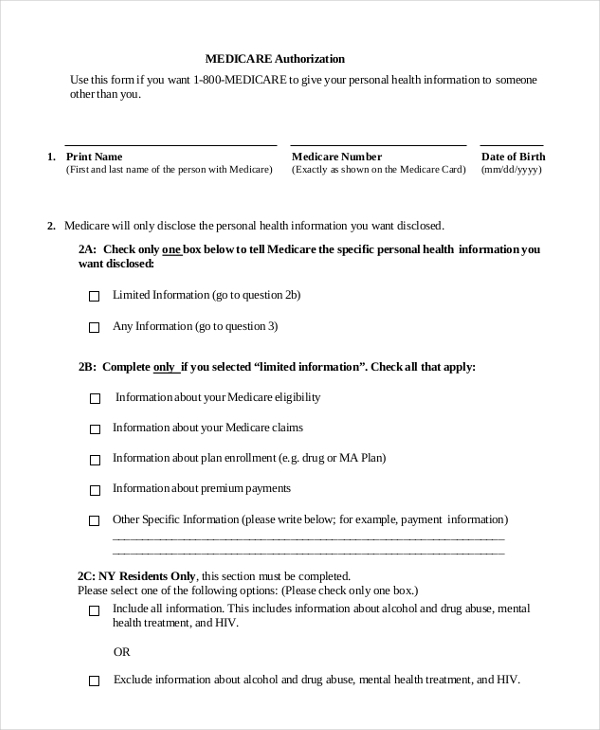 It presents details about disclosure of health information, Medicare eligibility, claims, premium payments, name and address of the person, obtains the signature and contact information. It also mentions the representative name, address and contact information. 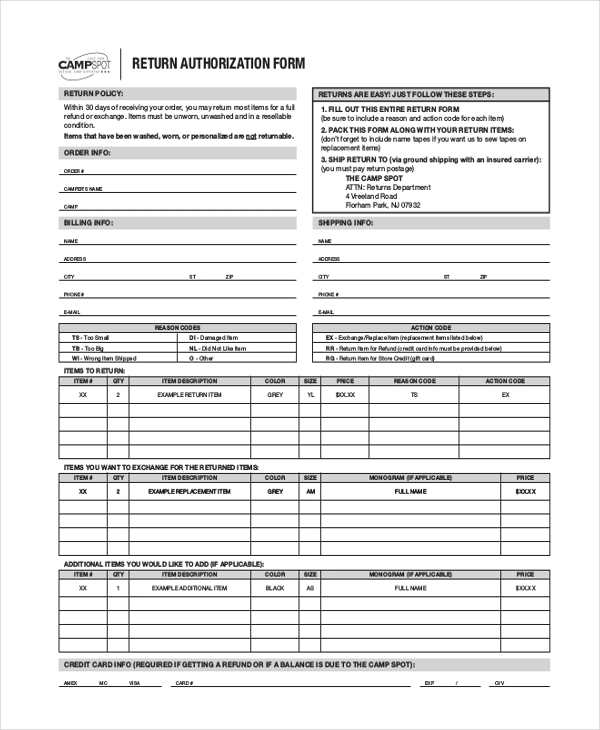 This overtime authorization form presents employee name, title, department name, overtime details including an explanation for working overtime, employee signature, and supervisor signature. It also mentions date on which overtime is sanctioned, date range to work overtime and number of hours that are restricted to work overtime. 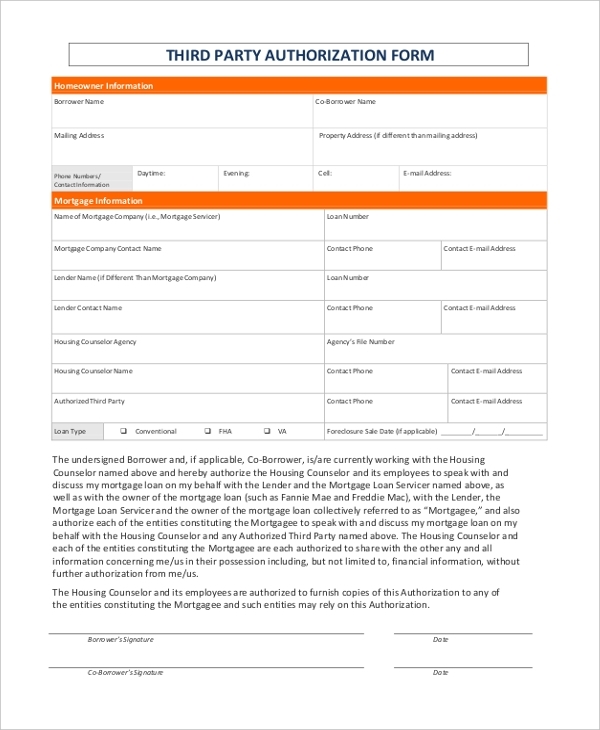 This third party authorization form provides homeowner information like borrower name, co-borrower name, mailing address, property address, contact information, and mortgage information like mortgage company name, lender name, lender contact name, an authorized third party, loan number, contact information and obtains borrower’s signature. 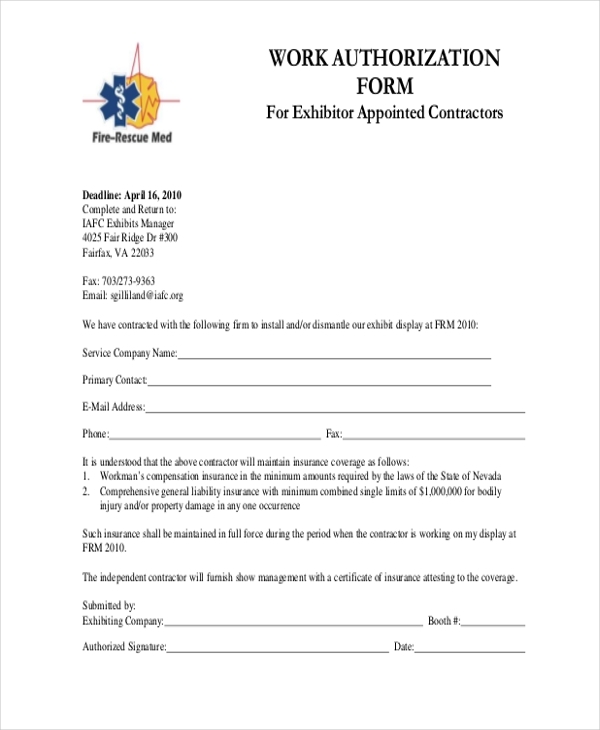 This work authorization form provides work authorization for exhibitors, appointed contractors to execute the works smoothly. It presents service company name, contact person, email id, contact information as well as contract scope and limitations. It obtains a signature from the exhibiting company, authorized signature and booth number. 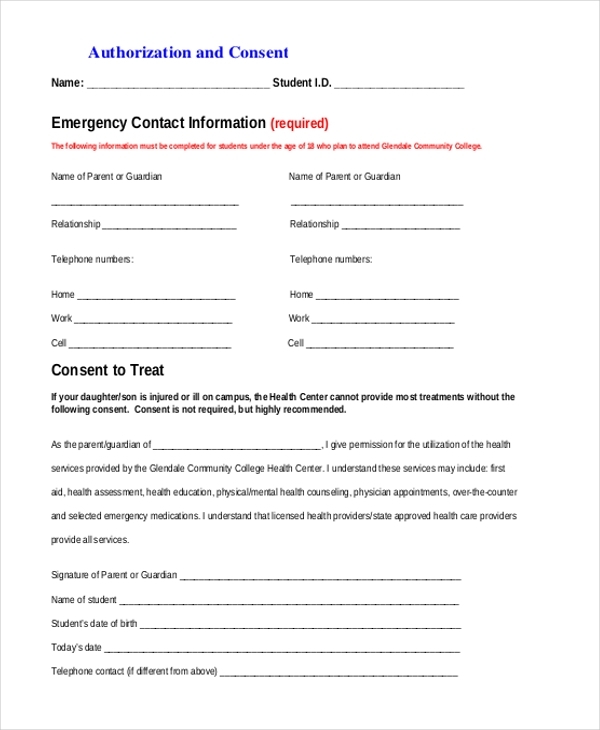 This authorization consent form is for treating a minor. It mentions the student name, identification number, parent name and contact information. It provides authorization to the college community center to provide treatment to the student. It also mentions student’s date of birth and obtains parent’s signature. 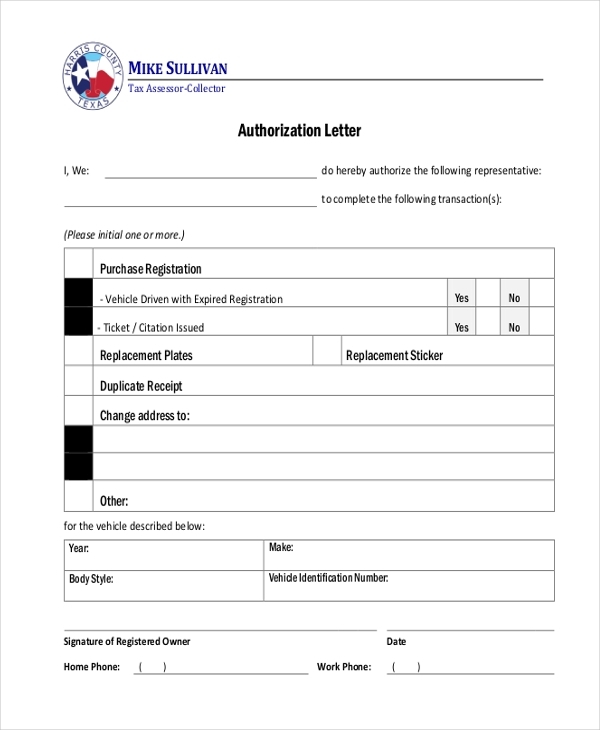 This return authorization form enables to return items for refund or exchange within thirty days of receipt. It presents order information, billing information, the reason for return, items details that are returned, items that are exchanged and additional items that are added. 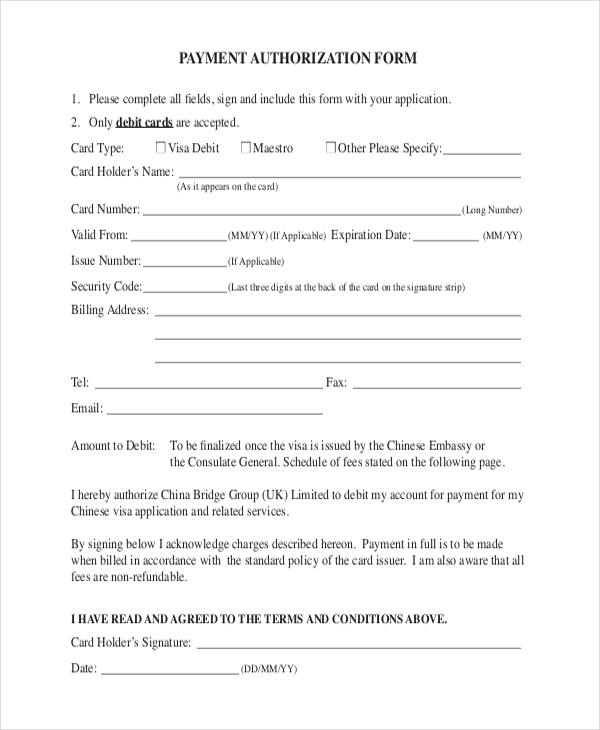 This payment authorization form provides authorization to an agency to debit the amount required for visa services from the debit card. It mentions the card type, card holder’s name, card number, validity details, billing address and contact information. It also obtains card holder’s signature. 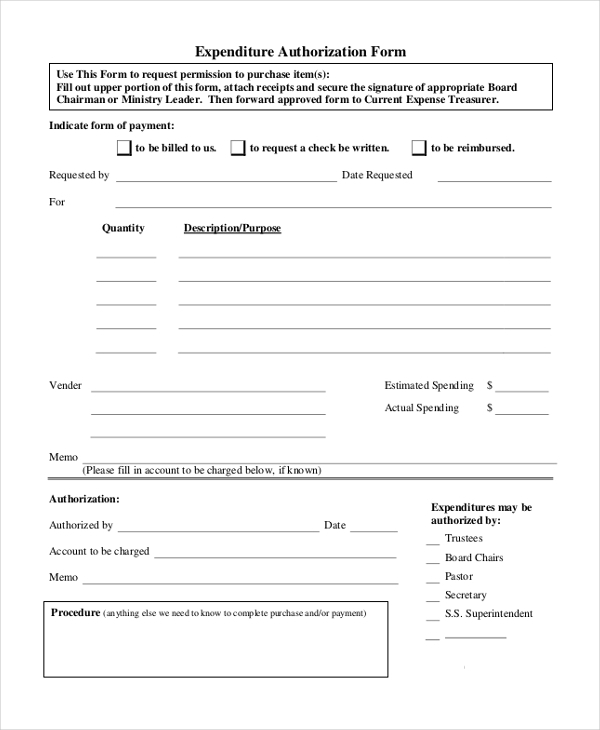 This expenditure authorization form enables to purchase items. It provides details of items, quantity, purpose, vendor details, authorization details including authorized person, account to be charged and memo. It also provides estimated spending, actual spending, person name who made requisition and date. 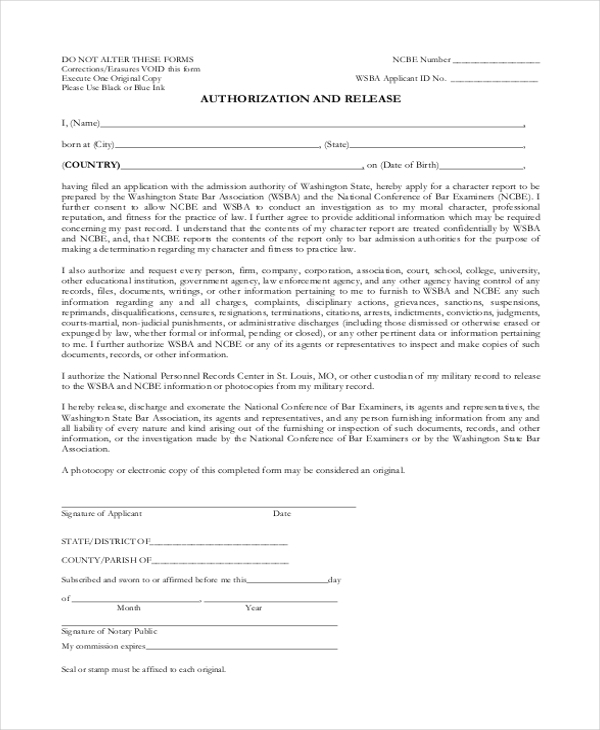 This authorization letter form enables authorization of representatives to complete transactions. It presents purchase registration details, replacement plates, sticker, duplicate receipt, change of address as well as vehicle details such as year and makes, body style, vehicle identification number. It obtains the signature of the registered owner of the vehicle. 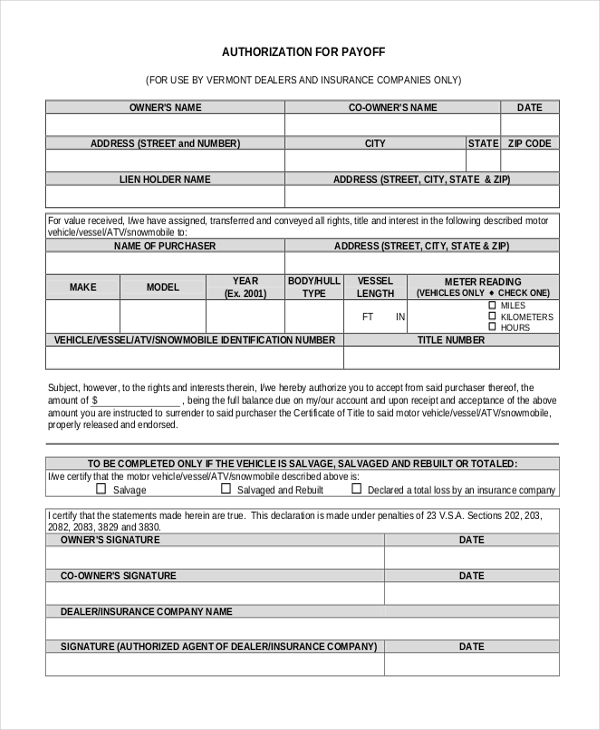 This authorization for payoff presents owner’s name, co-owner’s name, address details, lienholder name and address, the name of the purchaser and address, vehicle details like make, year, model, body type, vessel length, meter reading, vehicle identification number and the title number. This authorization and release form enables an applicant to apply for character report. It presents name, city born, state, country, and date of birth. It authorizes law enforcing agents and university authorities to furnish any charges or reprimands and provide copies of documents related to them. 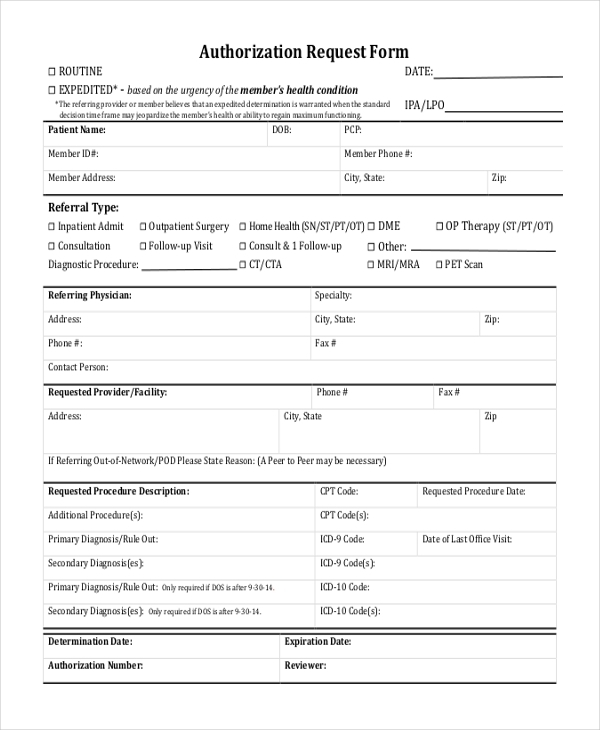 This authorization request form presents patient name, referral type, referring physician details like specialty, address, contact person. It also mentions requested provider details, requested procedure details like primary diagnosis, secondary diagnosis, requested procedure date, authorization number as well as reviewer name. How to Utilize Authorization Forms Effectively? Authorization forms are extensively used by individuals as well as organizations for various situations. They can be used by an individual or an agency to carry out works or services without any hindrances. They are useful to the individuals in obtaining health services, diagnosis, treatment and comply legal formalities. They can be used by individuals to apply for visas and allow the agencies to make payments towards visa charges. They can be utilized by the organizations to permit the employees to work overtime in case of emergency situations. They help the merchandise to return or replace the damaged items smoothly. There are tons of varieties of authorization forms available and one can utilize them as per their requirements. They are easily downloadable and editable forms which help various organizations to perform their activities easily. There are many authorization form templates available and for health care services one can check prior authorization forms for united healthcare.